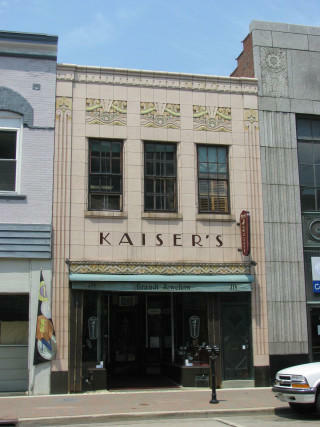 Art Deco styled, Terra Cotta tiled façade retail store. 6th Street is one-way west here. The store faces south. "The Kaiser's building is a small, two-story, cream brick commercial building, approximately 20 x 90 feet, with its long axis perpendicular to Sixth Street. In 1928, a new south facade was erected, based on drawings by Frank J. Hoffman of Racine. This facade consists of a single unit, which contains display windows and a central entrance on street level, with three windows on the second story. The entire south facade, with the exception of the decorative panels described below, is covered by glazed pink terra cotta panels. Pilasters at both the east and west edge of this facade feature fluting that ends in stylized volutes below the cornice. Above the copper awning cover over the display windows is an incised polychromatic terra cotta panel with geometric motif. Above the second story windows are three identical incised polychromatic terra cotta panels, with a stylized Deco sunrise motif. There is a shallow dentil cornice along the top of the building." Quoted from the National Register of Historic Places Application, August 1980, prepared by Robert D. Long, Architectural Conservationist, Racine, Wisconsin. The building was added to the NRHP November 25, 1980. If you check the photos from the NRHP Application from 1980, you'll see that a recent street rebuilding eliminated an ugly light standard that blocked the view of the building.